As we stumbled to our seats, we realized that we owed the instability of our body to the rhythm our brain was forcing on it, a rhythm that belongs to Swedish band Bastille's single, "Pompeii". Now this moving number is epic in its proportions. Although set in LA, when you watch the video, your mind's eye can easily conjure up images of an ancient civilization brought to the brink of doom by its own demise, and then hear its dying screams as the wrath of nature pushes it off of the brink. Now that we think about it, our expectations from this film were rather inexplicable, and the song must be held responsible. Never mind, though. Said expectations remained intact for about 10 minutes, up until our heroine said, in an accent as schizophrenic as her appearance, "'cuz it's the kind thing to do". The circumstances involving this pronouncement are as immaterial as they are imbecilic. We are still reeling under the shock of the realization that our director is only using the legend for its backdrop of immense explosion, with no intention of even attempting to make his actors uniformly British, if an accent must be used at all. We'll begin with the plot. 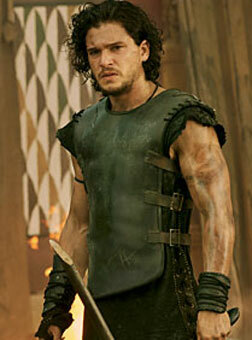 So, we have Kit Harrington (you'll recognize him better as Jon Snow from Game Of Thrones), all ripped, playing a belligerent gladiator called Milo (yes, we had to resist the temptation to see if he would respond to commands of the "Sit", "Roll over", and "Play dead" variety). Then, we have Cassia (Emily Browning), the daughter of a nobleman just back in Pompeii after a year's holiday in Rome. The year is 79 AD, and Pompeii is straining under Rome's rule. However, there isn't time for it to buck off the latter's firm hand, as Mount Vesuvius is rumbling with impatience. Pompeii's corrupt military head has an eye on Cassia, and it is up to Milo to rescue her from him and from turning into a petrified pile of ash. But only after singlehandedly slaying all the other gladiators in Pompeii, as well as its entire military. The plot is simple enough. It is what happens within it that is most astonishingly insanely asinine. For instance, what gets our hero into the final battle is the fact that her runs away with Cassia on horseback, and then rides back. We cannot for the life of us figure out why. Not if you give us a million years. There are so many things that occur so inexplicably that we are fairly sure the writer came up with the whole story in the bathroom. The performances are thoroughly ridiculous, which, we must mention, is not due to the actors' lack of diligence. This deficiency owes itself entirely to the characters' utter asininity. Not one character, no matter how central to the plot, says or does anything that might distinguish him/her from a host of stock characters. Every dialogue is a cliché, every deed one you have seen in a million other movies. Also, the film could easily have been cut short by a good half hour of the people not staring at each other or saying stupid things to each other. But then, the aforementioned explosions are truly as spectacular as you might wish. W S Anderson might not be the most erudite of the filmmakers, but he knows how to deliver the kablams. And since our hero is a gladiator, there is plenty of blood and gore, although rendered with restraint. One might wonder why the film was given an A rating. Too bad, then, that most of the action is concentrated in the last 20 or so minutes. The soundtrack blends in seamlessly, and you'll probably enjoy most of the film better if you saw it with your eyes closed. And, at the end of it all, you are sorely short-changed, for neither the explosions, nor the fights, make of for the fact that the film throws back into your face any intention you had of investing your emotions in it. While the graphics are good enough, it is simply not worth the effort to actually go to the theatre and sit through most of the film before getting to the good parts. Be the first to comment on Pompeii (Telugu)! Just use the simple form below. fullhyd.com has 700,000+ monthly visits. Tell Hyderabad what you feel about Pompeii (Telugu)!